I must say, I'm pretty smitten with my Li'l Cash - he looked like Sean Connery for so long and while I am a fan - Li'l Sean was NOT who this guy was supposed to be. So, like I usually do at that one special moment where my character comes to life - I shouted out with glee "I DID IT!!!!!!" It really is a fun moment...really fun. Li'l Cash stands about 12" tall and is 100% needle felted wool. 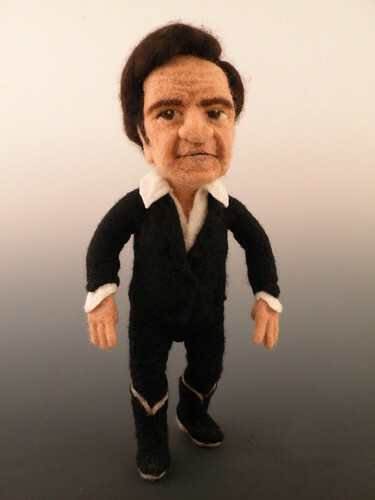 He is fully jointed with needle felted joints and stands on his own without the use of wire armatures. For his core, I used my favorite wool batting from www.zwool.com. For his flesh layer, I used my all time favorite needle felting wool - Norwegian C1 Felting Batts (beige peach for Johnny's flesh) from New England Felting Supply - For his suit, I used Merino Prefelt, also from New England Felting Supply. His hair is Merino roving. And like always, I used my Felt Alive Super-Duper, Color-Coded, Rubber-Coated Felting Needles.